Don’t get bowled over. Often stores and offices will put out a bowl of candy weeks before and after Halloween, and themed cookies and cakes abound. Don’t fall for the idea that one or two pieces won’t be a big deal. Those calories add up. Say no politely but firmly when offered treats. We have a friend who simply says she’s allergic to sugar when pressed to get in the holiday spirit. Try healthy alternatives. If your Halloween plans have you on the giving end, try some alternative treats this year. Even regular grocery stores often carry health conscious goodies, like natural fruit chews, dried fruit, chocolate chip granola bars, or dark chocolate covered nuts. Or think outside the box and give away low price toys, stickers, or temporary tattoos. Get out of the house. Instead of sitting at home with bags of candy, waiting for local trick or treaters, walk around your neighborhood, enjoying the decorations and costumes. You won’t be tempted to eat the extra candy and you’ll be getting some exercise. Avoid temptation. If you are buying bulk candy, choose something that won’t tempt you. Avoid your favorites and pick up something that you won’t be tempted to eat. Do your shopping last minute. Stores are open on Halloween, and their candy stock is often cheaper the closer to the holiday. Get your candy at the last minute and it won’t be sitting in your house, tempting you. Don’t skip meals. If you’re hungry, it will be harder to resist the sugar rush. 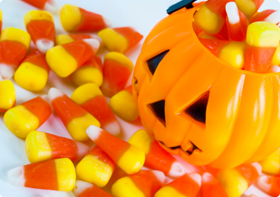 Make sure you’re eating nutritious meals regularly so you won’t be tempted to splurge on candy. Enjoy one a day. Choose one delicious treat to savor each day, instead of mindlessly snacking on a handful of goodies. Chew on this. Keep a pack of sugar free gum handy. You get sweetness with just a few calories and chewing gum can distract you from cravings. Teach your kids. If your kids are collecting baskets of candy, at the end of the night help them sort the booty into small servings and meter out the consumption as a treat to go along with a nutritious meal. We wish you and yours a safe and healthy Halloween!